In the Vatican's latest move to leverage its profile on social media, a Monday morning press conference will be held on a topic that, not long ago, would've been unthinkable: "The Pope on Twitter." In the works from early 2012 – and initially promised to launch as early as last Lent – the rollout of a papal handle will be led by a rare full-court press of the Holy See's lead communicators: the twin chiefs of the Pontifical Council for Social Communications, Archbishop Claudio Maria Celli and Msgr Paul Tighe; the Vatican spokesman, Jesuit Fr Federico Lombardi; the editor of L'Osservatore Romano Gian Maria Vian and Greg Burke, the former Fox News correspondent (and Opus Dei numerary) hired earlier this year as a media guru based in the Secretariat of State. The quintet will be joined by Twitter's California-based director of social innovation, Claire Diaz Ortiz. Within five years of its launch, the micro-messaging platform now counts some 600 million users worldwide. In early October, Facebook announced that it was being accessed by over a billion users a month. Monday's presser comes almost 17 months since the Pope clicked on an iPad (above) to launch the Vatican's News.va portal, and sent a tweet in five languages to announce it. While Benedict – who was recently reported to have an Apple tablet of his own, using it to "skim the [news]papers" – won't be clicking away in 140 characters himself, the PopeTweets are expected to synthesize his talks and messages in a sufficiently-sized format. For several months, rumors have pegged @BenedictusPPXVI – the pontiff's signature – as the chosen avatar, yet no firm details of the Pope's account are expected to emerge before the late morning briefing in the Holy See Press Office. Italian reports have stated that the account will be up and running some days after the press conference. While several organs of the Holy See – most prominently the Social Communications dicastery and the Vatican's in-house news division – already run Twitter feeds, the new foray reflects Rome's growing awareness of a key reality of digital culture: namely, that for something to take off and be fully embraced in the social media sphere, it needs to emerge from a person, not an institution. For those who could use the warning, if recent experience is any indicator, Monday's presser will likely spark a rush by newsrooms on church entities in the field, with the angle of "The Pope's on Twitter now... what's happening here at home on that front?" In some places, the question might still be greeted less with the sound of tweets than crickets. Gratefully, though, those are far fewer than they used to be. Beyond the @Pope rollout, another Vatican plank on digital media is already lined up – set to be published on January 24th, Benedict's message for the next World Communications Day will yet again focus on social networks, this time as "portals of truth and faith; new spaces for evangelization." More as it happens... well, where else? It is clear that there are some people on the net who are in turmoil [sic]. Despite the fact that it has not been officially presented, the news of the Benedict XVI's next tweet is circling the globe. The “140 character” social network Twitter is about once again to welcome the Pope. 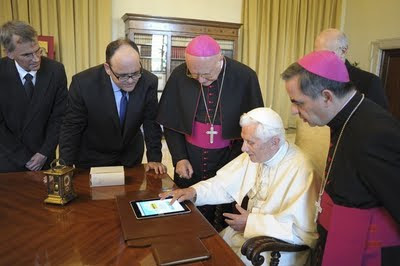 The first time the Pope tweeted was in June 2011 when he launched the Vatican portal www.news.va. Now we must wait a week or two before the Holy Father will take up tweeting again. “The initiative”, Archbishop Claudio Maria Celli, President of the Pontifical Council for Social Communications, said, “comes from the Pope's desire to utilize all opportunities for communication which technology offers and are characteristic in the world today”. The Archbishop explained further: “Just yesterday at the General Audience, the Pope once again demonstrated his desire to be able to speak of God to all people through every possible means. He recalled the fundamental importance of communication for the transmission of the faith. He spoke about God's method to communicate, the method of humility by which God did not hesitate to make himself one of us. He spoke about Jesus, communicator who addressed the people of his time, using their own language”. 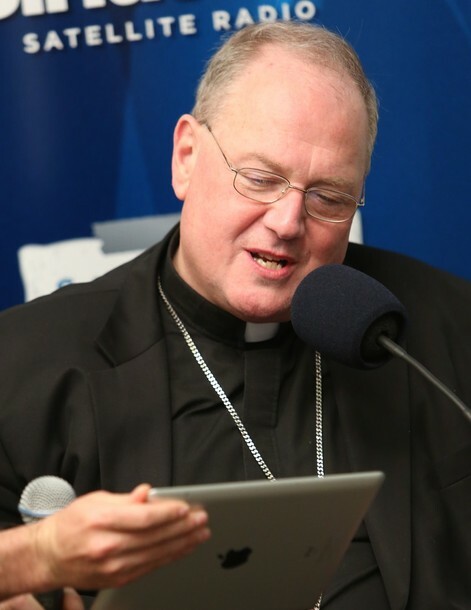 Then Archbishop Celli made a meaningful clarification: “The Pope, entering the world of digital communications, is acting in an original way in the history of the Church. In a certain sense he explained this yesterday speaking to the faithful in the Paul VI Audience Hall when, referring to the Letter to the Corinthians, he quoted the Apostle Paul: '...when I came to you, brethren, I did not come proclaiming to you the testimony of God in lofty words or wisdom...'. It is precisely in this that the meaning of the Pope's presence on Twitter – that world of microblogging, of modern, quick, immediate communication, unforgiving in its allowance of 140 characters with which you must say everything – is rooted”.